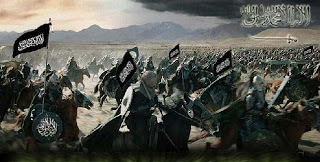 The Battle of Yarmuk was part of the campaign to conquer Syria and open it to Islam. The Amir of Jihad was Khalid bin Walid who was appointed by the Khaleefah Umar ibn al-Khattab. At the start of the battle a Roman general by the name of George emerged from the Roman centre and rode towards the Muslims. Halting a short distance from the Muslim centre, he raised his voice and asked for Khalid bin Walid (Amir of Jihad). From the Muslim side Khalid rode out, delighted at the thought that the battle would begin with himself fighting a duel. He would set the pace for the rest of the battle. You have the power to end the bloodshed, to remove the corrupt Assad regime and to give support (nusra) for the establishment of Khilafah. This Khilafah will bring peace and unity once again to the blessed land of ash-Sham after decades of oppression. Seize this opportunity in the month of Ramadhan to become one of the heroes of ash-Sham like Khalid bin Walid and Abu Ubaidah ibn al-Jarrah, and achieve the greatest prize of all – Al-Jannah.